An effective program can increase the reliability and availability of machinery while minimizing maintenance costs. The practice of oil analysis has changed drastically from its inception in the railroad industry. In today's exploding computer and information age, oil analysis has evolved into a mandatory tool in one's predictive maintenance (PdM) arsenal. As a PdM tool, oil analysis is used to uncover, isolate and offer solutions for abnormal lubricant and machine conditions. These abnormalities can result in expensive, sometimes catastrophic damage that causes lost production, extensive repair costs and even operator accidents. The goal of an effective oil analysis program is to increase the reliability and availability of machinery while minimizing maintenance costs associated with oil change-outs, labor, repairs and downtime. Accomplishing this goal takes time, training and patience; however, the results are dramatic and the documented savings and cost avoidance are significant. 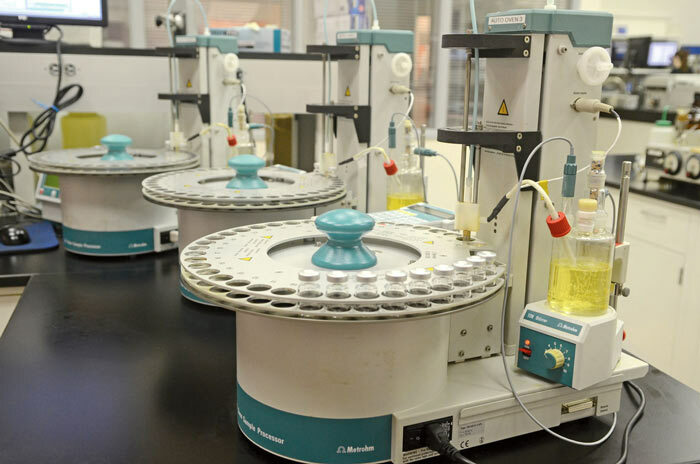 Lube oil analysis helps companies maintain equipment. In order to take full benefit from oil samples' test data, it is important to understand a lubricant's basic properties. Equally important is the understanding of how these properties affect the lubricant's ability to function. Lastly, knowledge of the common test techniques and instrumentation used to analyze oil can aid in data interpretation and lead to more productive corrective action. To effectively monitor how well a lubricant is working, the lubricant's functions must be understood. The primary function of a lubricant is obviously to lubricate, that is, to reduce friction. By reducing friction, wear is reduced, as is the amount of energy required to perform the work. In 1699, a physicist named Guillaume Amontons deduced that friction is the result of surface roughness. Since no solid surface is perfectly smooth, opposing friction surfaces have peaks called asperities that come in contact with one another. Ideally, a lubricant will physically separate these asperities with an oil film. This is called full fluid film lubrication. When the proper lubricant is used and the proper load is applied, the asperities are not in contact and, in theory, no wear will occur. When inadequate lubrication is present or the load is increased, the oil film will not be thick enough to fully separate the asperities. 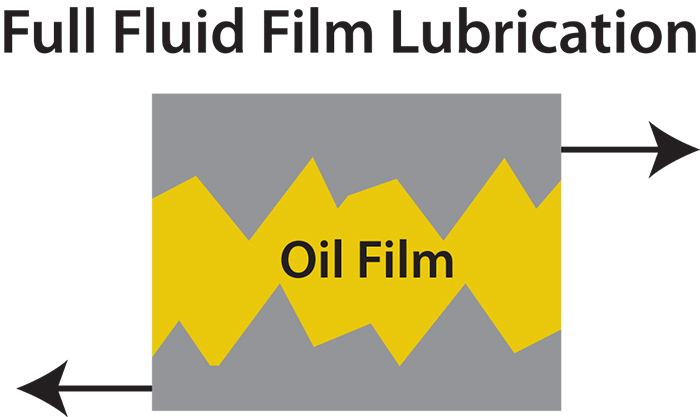 Mixed lubrication, which is a cross between boundary and hydrodynamic lubrication, occurs when the oil film thickness is equal to the average asperity height. The largest asperities will come in contact and result in increased wear. Many oils are fortified with anti-wear additives to combat wear under these circumstances. As load continues to increase or lubrication degrades, boundary lubrication occurs and the oil film thickness cannot separate the friction surfaces. This can result in metal-to-metal contact. At this point, asperities are adhering to one another, causing severe machine wear. This can also manifest itself during periods of shock loading, startup or shutdown. Extreme pressure additives are used in oils that frequently encounter these types of situations. Image 1. Lubricant condition is monitored with tests that quantify the oil's physical properties to ensure that it is serviceable. Lubricants also control the equipment's temperature. Oil absorbs heat generated at the friction surface and carries it away to be dispersed. Many systems incorporate heat exchangers or radiators to aid in removing heat from the system. Along with heat, lubricants transport dirt and other debris away from the friction surface. Particulate contamination leads to increased wear through abrasion and reduced oil flow. Some oil additive packages contain agents that break up contaminants and hold them in suspension to be filtered out. This prevents harmful deposits and varnish from forming within the equipment. Alkaline additives also protect the components by neutralizing acid and preventing corrosion. Hydraulic oils have the added function of transmitting power. To function properly, hydraulic oil must be clean and free of contaminants. Many contaminants will cause oil to foam and entrain air or water. Entrained air causes the oil to compress under pressure, resulting in a loss of power. Particulate contaminants can cause the control valves to malfunction and restrict the oil flow. Selecting the proper lubricant, along with maintenance of that lubricant, is essential to ensure protection for any machine. Proper lubrication is defined as the correct amount of the correct lubricant at the correct time. Maintaining a lubricant means ensuring it has the correct viscosity and the necessary additives for the application. Steps must be taken to keep the lubricant clean and serviceable. Oil analysis is the most effective way to prolong the useful life of lubricants, while maintaining maximum protection of equipment.